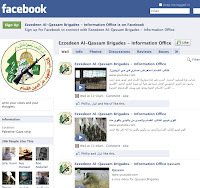 ACTION ALERT: REPORT ISLAMIC TERRORIST HAMAS FACEBOOK GROUP! Due to Facebook's continued negligence on these issues, Hamas and Islamic jihadist propaganda is allowed to continue to flourish, while Jewish activists trying to address these issues, are proactively censored. 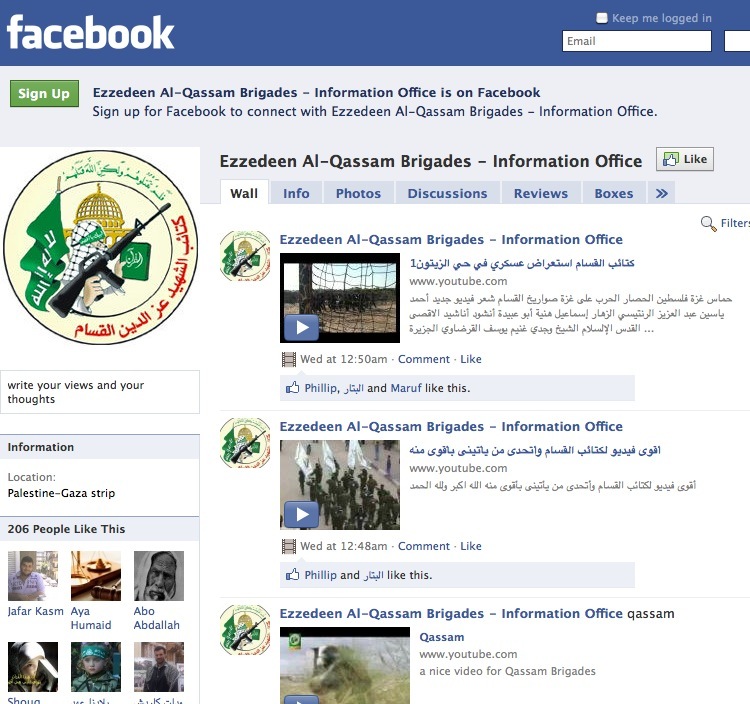 The recently created, Ezzedeen Al-Qassam Brigades - Information Office page already has over 200 fans who "like" Hamas. The group is filled with photo galleries and other content which celebrates terrorism, clearly promoting Islamic terrorism, hatred, and violence against Jews and the Jewish State. We urge you to click on it, scroll down to report the page on the bottom left. We also urge you to fill out the form to report terrorist content on Facebook, here. As many of you know, the JIDF is the only organization on top of these trends. We have been responsible for the targeting and removing of dozens of Hamas pages and groups on Facebook, and hundreds of other antisemitic and jihadist pages as well. While there are many imitators of our work, trying to report anything remotely anti-Israel to no avail, after detailed conversations with senior people at Facebook, YouTube, and other online companies, we know their attitudes and what the TOS are. We don't have you waste your time telling you to report material which is not breaking any rules. As we told the Jerusalem Post in July of 2009 when we were responsible for getting a massive Nasrallah page removed, "we will fight Amalek on every front." If you appreciate our work, please support our effort however you can. First, by responding to our action alerts and sharing our content widely (RTing our messages on Twitter, sharing them on Facebook, blogging about them, etc). But most importantly, we feel that anyone with an internet connection who appreciates what we do, can afford at least $5/month. Please click here to help keep this fight going strong. The JIDF strikes AGAIN! As you can see by clicking the link, it just takes you to your Facebook homepage. That means the group is now gone! We did our job! Thanks to everyone that helped!